Ravi Shankar (the sitar virtuoso who became a hippie musical icon of the 1960′s after hobnobbing with the Beatles and who introduced traditional Indian ragas to Western audiences over a 10-decade career) died Tuesday. He was 92. A statement on the musician’s website said he died in San Diego, near his Southern California home. The musician’s foundation issued a statement saying that he had suffered upper respiratory and heart problems and had undergone heart-valve replacement surgery last week. Labeled “the godfather of world music” by George Harrison, Shankar helped millions of classical, jazz and rock lovers discover the centuries-old traditions of Indian music. He also pioneered the concept of the rock benefit with the 1971 Concert For Bangladesh. To later generations – he was known as the estranged father of popular American singer Norah Jones. 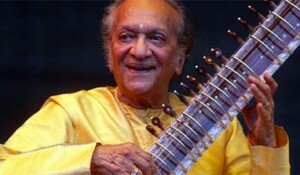 Pandit Ravi Shankar (the best known contemporary Indian musician) died Tuesday evening in San Diego, Calif. He was 92. Shankar’s final performance, on Nov. 4 in Long Beach, Calif., was billed as a celebration of his 10th decade of making music. But it was his association with the Beatles – in particular, guitarist George Harrison – in the 1960′s that helped introduce Shankar to a global audience. The Times of India reported that Shankar was awarded Indian’s highest civilian honor, the Bharat Ratna, in 1999. He also received three Grammy Awards – the Times reported. Shankar was the father of jazz singer Norah Jones as well. He is also survived by three grandchildren and four great-grandchildren, according to his record label East Meets West Music. His health had lagged over the past year, according to a statement from his record label, and he underwent heart-valve replacement surgery last Thursday. “Unfortunately, despite the best efforts of the surgeons and doctors taking care of him, his body was not able to withstand the strain of the surgery” – his wife and daughter said. In the 1960′s he took Eastern music mainstream in the West, lending ethereal, spiritual sounds to the Fab Four through his friendship with Harrison. Virtuoso performances at Monterey in 1967 and Woodstock in 1969 helped cement his place in Western musical history as an ambassador of Eastern wisdom to a generation looking for new values. In Bangladesh’s bloody war of separation from Pakistan in 1971, Shankar and Harrison launched the first massive fund-raising pop event – according to UNICEF – the Concert for Bangla Desh, to generate donations for the flood of refugees pouring into India. But his career had a long life before and after the 60′s. He was born on April 7, 1920, and when he and Harrison met, he was already 46 and famous in India as a classical musician – according to his record label biography. This entry was posted on Wednesday, December 12th, 2012 at 7:03 am	and is filed under Tragedy. You can follow any responses to this entry through the RSS 2.0 feed. You can skip to the end and leave a response. Pinging is currently not allowed.